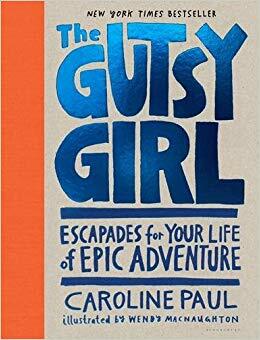 I read The Gutsy Girl: Escapades for Your Life of Epic Adventure by Caroline Paul when I was travelling in Greenland in June 2016. I had first heard about Caroline Paul a few months before, in her Tim Ferriss podcast, and fell in love with her incredible bio (including credentials such as lunger, firefighter, paraglider, author, and pilot). For a book about being a gutsy girl, there couldn’t be a better author. Yes, the book is aimed at younger girls, but that shouldn’t stop you from reading it. There was so much in the book that I would’ve loved to hear when I was that “shy and fearful kid”, but it’s just as welcome now in my twenties. And I think it would be for my forties, fifties, and onwards. From The Gutsy Girl. 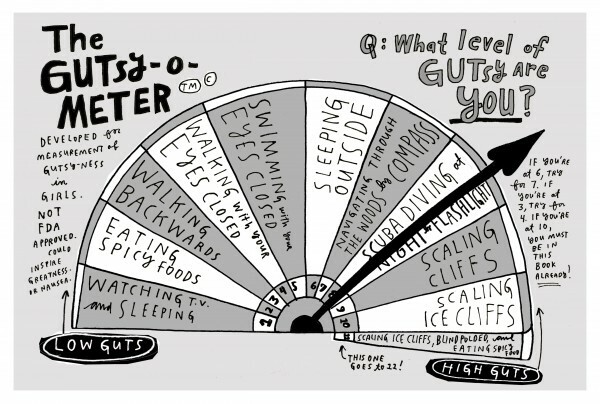 Image: Wendy MacNaughton. I don’t know about you, but I know my life is simply better when I can sea kayak, climb trees, and enjoy a sandwich on a mountaintop. Adventure balances out my occasional seriousness and inability to understand jokes. I’m no Bear Grylls, but I give myself permission to call myself an adventurer. It’s a title that you give yourself before others do. And when that’s how you define yourself, it’s pretty hard to live a boring life. It’s so easy to hang on to our fears when all we need is a gentle nudge to remind us that our life should be a grand adventure. That’s just one reason to have books like The Gutsy Girl around us. Another reason? The beautiful illustrations. It’s Lean In for middle grade girls, set not in the workplace but on bicycles, tree branches, sea kayaks, and cliff edges. If you’re a female adventurer on any level, you should read it. And buy it for all the young gutsy girls you know. ‘You’re there, but I’m not concentrating on you!’ I told Fear”. What’s the sentence you’re going to tell yourself day in and day out? Write your two obituaries, just like Roz Savage did. One for the person you are now and a second for the person you want to be. If you haven’t built anything lately, write down what you want to build, and why. Keep an adventure journal (remember, an adventure doesn’t have to be scaling a high mountain). Write down how it makes you feel, be it confident, nervous, or proud. List four people who you admire, then write down the qualities in them that are so inspiring. Think about how you can incorporate those qualities into your own life. Look at the list when you need guidance, want inspiration, or just for fun. What adventures and goals do you have for the future? Write a Life List. Don’t worry if they seem impossible, just write them down. Learn to ask for what you want. Write down four things you want that a person can grant if asked. Now write down the name of the person you would have to ask and the sentence you need to say in order to obtain it. Write “I want to gain confidence in . . .” and fill in the blank.